‘Tis the season of giving! Don’t be a Scrooge, give your community the gift of quick and convenient online payments this holiday season. Whether you’re unfamiliar with this feature or a seasoned pro, we’ve got some tips and tricks to help you make the most of your website’s online payments feature! While you could utilize a third-party service to collect payments from residents online, it could end up costing you a pretty penny. In addition to the extra cost, it would involve another interface for residents to familiarize themselves with, making this both a costlier and more inconvenient option. Luckily, our online payments system is included with a subscription to our deluxe plan at no additional cost. Plus, it's fully integrated with our software (no need to leave and visit another website), streamlined, and incredibly easy to use. It really is the gift that keeps on giving! Don’t already have our online payments feature set up? What are you waiting for?! You can easily do this from the “Online Payments” section in your Admin Control Panel with our quick setup process. If you would like a single fixed amount, multiple fixed amounts, or to have the resident determine the amount of the payment. The payment methods you'll accept (credit/debit cards, bank accounts, or both). The actual amount(s) of the payment option. Whether to allow multiple payments per resident. This is a great option if your payment option will need to be paid monthly or quarterly. Who will cover the transaction fees (your community or your residents). Managing your payment options is painless, with everything you need located in the “Online Payments” section of your Admin Control Panel. In here you can activate/deactivate payment options, review the details of each payment option, and export this information. Additionally, you can refund a resident who has already submitted a payment. Need to update your community’s bank account? Just click on the “Update bank account” button found in this section. You can also edit and delete your payment options. Note: You may only delete a payment option if a payment has not been received for it. Interested in seeing your community balance history in detail? Not a problem; we’ve got that and more to share with you. You can view this and the balance available to your community, what’s currently pending to be transferred, and the total amount of funds collected from all of your online payment options. Furthermore, no need to worry about transferring the funds yourself—we take care of that for you! Funds are automatically deposited into your community’s linked bank account once a week. Pretty easy breezy, right? 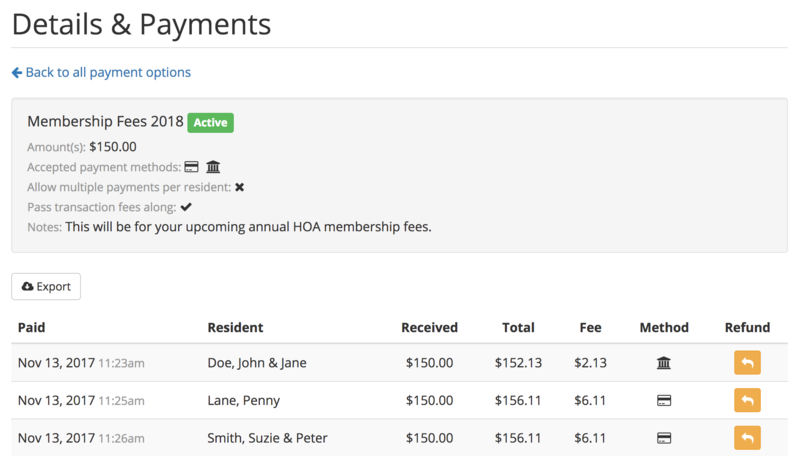 As payments come in from your residents, the payments list and community balance will automatically update to show you all of the information you'd like to know without the wait. For extra analysis, and for more information about each payment, you can export the payment list too. There’s another aspect you won’t need to worry about, and that’s security. We’ve made it a priority to create a highly secure system for our online payments feature so you can rest assured that your information is safe. One critical component of our security is the fact that all our community websites are 100% encrypted with SSL. We've also partnered with a leader in the field to handle the entire payment process behind-the-scenes. They process payments for Facebook, Salesforce, Pinterest, Lyft, Amazon, Under Armour, and over 100,000 other companies across the globe. Sensitive data like bank account info, credit card numbers, and other details never touch our system—they're handled entirely by this payment processing company. They're certified as PCI Service Provider Level 1, which is the most stringent level of certification available in the payments industry. If setting up this feature isn’t already at the top of your holiday wishlist, then it should be now! Gathering community funds is easy and affordable. Our integrated online payments feature will grant you and your community the gift of convenience, accessibility, and ease, leaving your community’s (metaphorical) pockets jingling all the way home!